Planning a circuit in your home requires examining some basic rules regarding the number of lights permitted on a circuit, and recommendations for mounting boxes, receptacles and switches. You are only allowed to put a maximum of 12 lights on one 15 amp circuit, but try for between 8 and 10, if you are combining receptacles and lights. Remember that switches don’t count as outlets. Run a separate circuit for any large appliances, pumps, and motors etc. Start by marking the studs where you want your receptacles, switches, and lights to be located. Then mount your outlet boxes. Screws are required for octagon boxes but you can use either screws or nails for switch and receptacle boxes. The important thing to remember is to make the boxes secure because, once the drywall is on, it’s hard to re-attach them if they do work loose. Don’t forget that you must leave the boxes sticking out from the face of the stud, slightly less than the thickness of the product that the wall will be finished with. Mount receptacles about 300 mm (12 inches) above the floor. The general rule is that a receptacle is required for every 3.6 meters (12 feet) of usable wall space. You are probably curious as to what usable wall space means exactly…any measurement from the corner of a wall to a closet, fireplace, or to where the door swings open is considered usable wall space but, only if the wall is over 900 mm (3 feet) to begin with. A receptacle is needed every 3.6 meters (12 feet) along a continuous wall space so that at no time can a cord connected devise be any more than 1.8 meters (6 feet) from an outlet. Also remember that there is no maximum number of outlets, so make sure you have enough, and that they are placed in convenient locations once the room is finished. Mount switches on the inside of rooms opposite to the side that the door opens. Make them as close as practical to the door opening, but not so that the cover plate will interfere with the door casing. The height is fairly flexible, but should be consistent and practical (any where from 1.1 to 1.3 meters or 44 to 52 inches). Attempt to start your circuit close to the panel and then move out from there. For a standard sized outlet box you are only allowed a maximum of five (5) wires (excluding the bare ground wire). Keep this in mind when running your wires, as you cannot run power into a receptacle, and then feed two outlets from the same box. This would give you six (6) wires therefore requiring a “deep box”. A standard octagon box used for light outlets has a maximum wire fill of seven (7). These box fill maximums are also based on #14 gauge wire which is what you will use throughout 95% of your home. Here are two examples of how to set up a typical circuit and how you would run your wires. Refer to methods 1 and 2. Keep in mind these are just examples and your wiring does not have to look exactly like I’ve shown. This is just a starting point for you to begin. Once you have an idea of how you are going to run your wires, drill all the holes in the studs. (A 3/4″ to a 1″ auger bit, driven by a 1/2″ drill is the best tool for the job). Make sure to keep the holes at least 1″ in from the face of the stud, so that drywall screws or nails cannot penetrate far enough to damage the wires. Do yourself a favor and leave plenty of slack at each outlet. I recommend at least 300 mm (12″). Then strip the exterior sheath back about 150-200 mm (6″-8″) leaving a loop of slack before tightening the box clamps down on the sheath. This is done to ensure that if the wires get damaged in any way, you will still have some slack to work with. You are required to secure the wires with approved wire staples, within 300 mm (1 foot) of the outlet boxes. Also, every 1500 mm (5 feet) on a free run of wire there must be a staple. Going through a hole in a stud counts as being secured. Make all the splices that you require at the “rough-in” stage, so that when you come back to install the receptacles, switches, and fixtures, it will be clear as to what wire goes where. 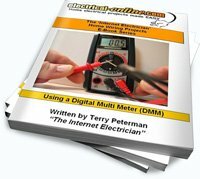 This entry was posted in Creating a Wire Diagram and tagged circuit, diy, do-it-yourself, do-it-yourself wiring, electrical, electrical wiring, home electrical wiring, home wiring, house wiring, how to plan a circuit, lights, mounting boxes, outlet box, panel, planning a circuit, receptacles, switches, wires, wiring. Bookmark the permalink.